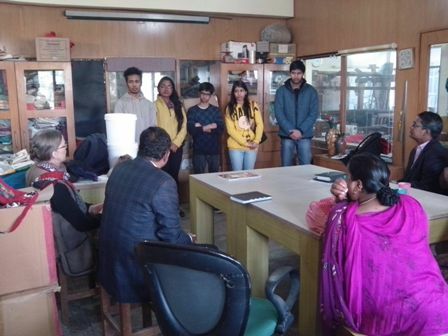 On January 5th we invited students from Enactus Society at Hans Raj College to demonstrate a new social enterprise product that they are launching to Mr. Kapil Singh from Support Foundation and Mr. Anil Kumar from Netherlands Leprosy Relief Foundation (NLR). 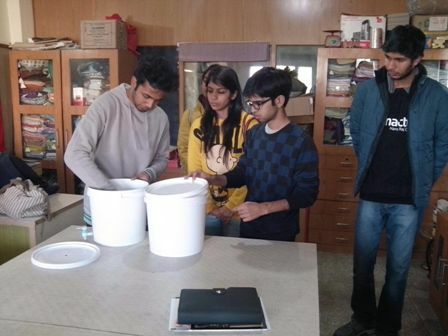 The Enactus members are looking for unemployed people to assemble a low-cost water filter which they are going to market. Anil brought three members of a Lok Mata Leprosy Colony, Delhi to see if they are interested to do the work. The students will procure the food grade plastic buckets and also the filter parts as well as attractive labels and packing materials. They need a communal space where the women and men can come and assemble, label and pack the filters. The visitors from the leprosy colony asked a number of questions and were able to find out that they would earn at least Rs 50.00 per set, making it an attractive proposition as the process is simple and fast. The students will visit Lok Mata Colony on the afternoon of January 6th and hopefully four or five women will find some part-time work in their own community which will not require them to have very much training. Over time it is hoped that the Enactus team will step back and hand the business to the small group of assemblers should they prove capable of running it themselves. The Enactus team also shared a project they are involved with together with The National Bee Board to teach rural people how to keep bees and produce honey. MESH is especially interested that NLR Foundation should consider this an income generation activity for a self help group in colonies where they work. MESH would be glad to try and help with marketing of organic honey from a leprosy community. This was one of the first activities that Gabriel Rajsingh, our new Producer Development Social Worker has attended and we are gald that he has forged links early on with NLR foundation and Support Foundation.